Tent City in Texas where children and being held. Little Rock Trump’s executive order claimed to end the family separation policy, but it doesn’t end the crisis or solve the problems. Officials from the Department of Human Services and Immigration and Customs Enforcement reportedly were scurrying around the country trying to find federal facilities that could house up to 20,000 unaccompanied children and an untold number of others. They were particularly enamored of military installations, viewing several locations in Texas and Arkansas. One site they inspected was an abandoned US Department of Agriculture site in Kelso, Arkansas in the southeastern delta area of the state. That site is only two miles from Rohwer, Arkansas, little known for anything much these days and hardly a postage stamp of a town, but infamous for having served as one of the notorious Japanese-American detention camps during World War II in one of the darker periods of American racial and ethnic history. Even as tone deaf as the Trump administration has been about its mishandling of the migrant and refugee crisis at the border with Mexico, it is still hard for me to believe they would be clueless enough to allow the media a political field day that would come with setting up a 21st century version of the same horror so close to the ongoing stain of America’s own experience in running concentration camps. Mayor DeBlasio of New York City was horrified visiting a center in his city that held over 200 children that had been separated from their families at the border and was protesting loudly his inability to get answers from federal authorities on the status and future of these children. The Mayor of Houston told the federal government he did not want them to construct a planned detention center in his city. Governor Cuomo of New York said his state didn’t want to have anything to do with children and family detention centers. In the alternate reality of Arkansas, Governor Asa Hutchinson welcomed the feds interest in his state and made suggestions, including about the feasibility of the Little Rock Air Force Base as a detention facility. There is controversy in Arkansas over monuments celebrating the ten commandments on the state capitol grounds, but any religious concern by conservative Arkansas politicians for family values evaporates when they start reading the stories about billions of dollars of contracts and jobs galore to run these children prisons. I think there are a good many passages in the bible about the dangers of serving mammon, which is the greedy pursuit of wealth, as opposed to God, but I’ll leave that argument to others. 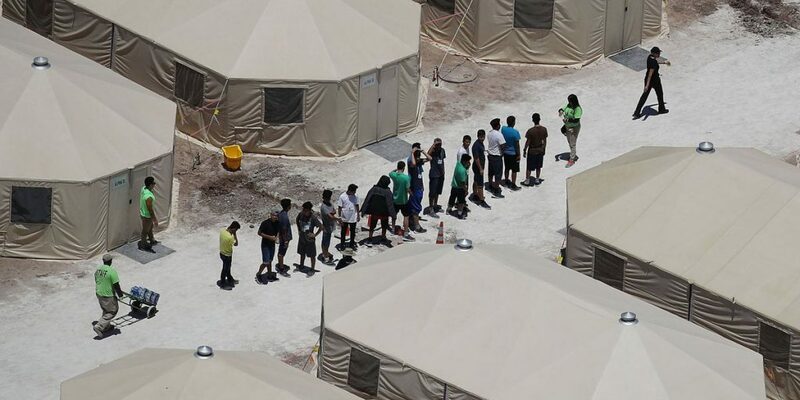 While the Trump administration is real estate shopping for prison facilities, their lawyers are begging the federal judge to allow them to extend the time they are able to hold children past twenty days and potentially hold their families indefinitely. The judge has expressed previous reservations about the handling of immigrants and is the daughter of immigrants herself. Trump’s pleading faces an uphill battle. I listened this morning to the director of Catholic Charities in Fort Worth, Texas that have received about twenty of these children between five and twelve years old from the federal Office of Refugee Resettlement. Some of the young children have no idea what a phone number for their families might be. Others can hardly speak, complicating resettlement. They continue with their policy of trying to find family members to take the children and try to connect them to their families, while standing in solidarity with their bishop and his condemnation of the Trump program as an insult to the “right to life” and its dignity. A piece of paper won’t solve this crisis, nor will hard lines and hard hearts.